College-level reading is typically more difficult than similar high school assignments, but there are a number of resources to help get you on track now and while you are in college. This may sound obvious, but the best way to learn any skill is to practice! If you have reading assignments for class, ensure you do them. If you have optional reading assignments (i.e. supplementary texts to increase understanding), complete those as well. If you would like even more material to peruse, ask older family members or friends about the books they loved reading in college. The important point here is volume—read as much as you can. 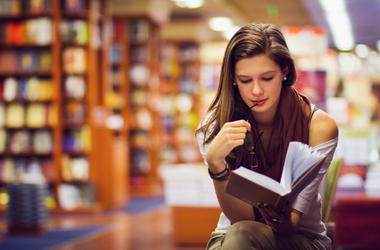 For many high school students, reading for pleasure involves light selections. However, it is important that a significant portion of your college-bound reading includes academic articles or texts, as well as high-level novels. Your instructors and mentors can direct you toward classic novels, and extremely difficult works can be parsed with an adult to ensure comprehension. You might also try to read industry-specific or literary magazines. If you hope to major in a particular subject, research which journals professionals in that field read. After all, classes in your prospective major may soon require you to do the same thing! This is the crux of the matter—there is much more reading in college, and you will frequently need to complete readings across many different subjects and styles within a single day. A wonderful way to prepare for this reality is to highlight your reading for school. Review the document that you have chosen to highlight, and if you realize that you are highlighting 50% or more of the page, set a timer and try to peruse the next page in a more efficient manner. If you need to time yourself, do not be afraid to do so! There are a number of tips and tricks to read faster and skim effectively – but it is, again, a skill that requires practice and preparation. It is more important to know that you are able to understand these dense readings than it is to simply work through them at the fastest speed possible. Again, the desire to read quickly is an admirable goal, but it is a skill you will learn through practice. If you find your homework to be a slow process during your first semester, there is no need to worry. You will not succeed, however, if you do not comprehend the text’s main points. College-level reading is typically more difficult than similar high school assignments, but there are a number of resources to help get you on track now and while you are in college. There are writing centers, school support staff, and so on, to help you acclimate to this collegiate reality. Most schools also offer first-year seminars or transition-style classes to help freshmen adjust to the high level of academic work that is expected of them. And with the above suggestions, you will be well on your way to a great first year!